I am THE absolute worst at keeping up with hair trims! My hairdresser (which I LOVE!) tells me to come in at least every 6-12 weeks at most but I don't (eek!). I know it's not good for you hair especially when you're actually trying to grow it out, but since starting school, a new job, and juggling blogging it's been hard to make the time to go take care of all those "necessary" things. With that kind of hair situation going on, I always try to choose products that help keep my hair as strong & healthy as possible. 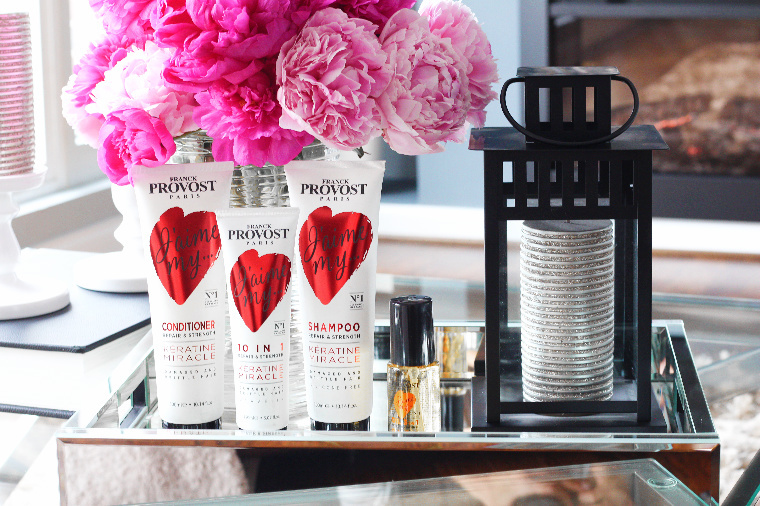 The Franck Provost J'aime My... hair line is new & sold exclusively at Ulta. The Keratine Repair & Strength line is the one I want to review and share with you all along with the Oleo Nutrition & Softness 3 in 1 Leave In Oil Treatment (SO GOOD!). What I love about their line, though, is that there is something for everyone! They have so many different products for color protection, dry hair, blondes, etc. You can view them all HERE. I want to start with the Oleo Nutrition & Softness 3 in 1 Leave In Oil Treatment because I shared it with you guys on Instagram Live while in Punta Cana and don't know what I would've done without it on our trip! This is the first hair oil I have tried and where. has. it. been. all. my. life!! But, really! 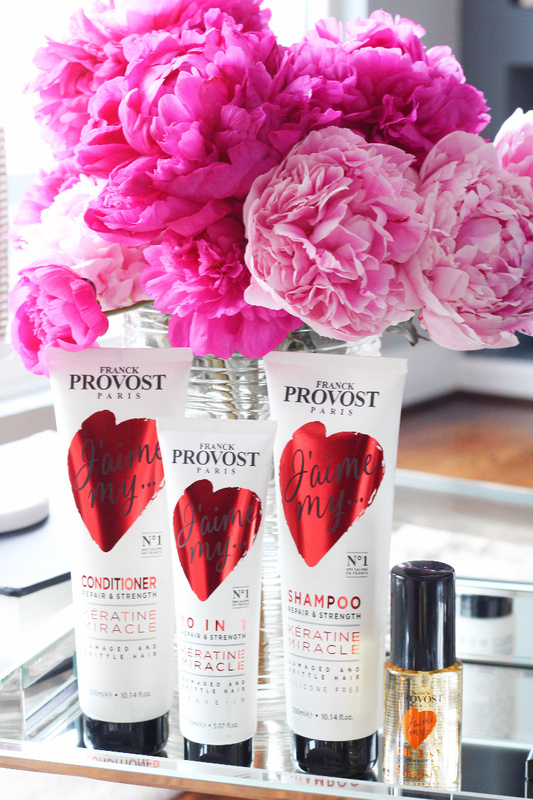 It's a game changer and love that you can use it on wet and dry hair!! My ends are obviously not the healthiest and the sun, heat, and salt water didn't help, so this oil was a life saver! I applied it to my ends before I blow dried or styled my hair and it kept it so soft and moisturized! It also made my hair drying time SO short, almost like the oil just dried out all the water! Be careful when applying it to your roots because you don't want it to make your hair look greasy, but I did put a drop in my hands, rubbed my hands together really well and lightly patted it on top of my head before brushing it in with my fingertips and it really helped get rid frizz and fly-aways! If you're going to get any of these, this is the one you definitely need! The Keratine Repair & Strength 10 in 1 Leave In Treatment is another favorite! I used this one right out of the shower to the lower half of my hair. It promises to coat and strengthen your hair, but I immediately made my hair nice and soft making it easier to detangle after a shower. Lastly, the Keratine Repair & Strength Shampoo and Conditioner. Again, this line is made to help repair & strengthen your hair which I have not really noticed in particular because I feel like that is something that may be noticed over a longer period of time, but I did notice a few things... I definitely noticed that the shampoo actually cleaned my hair. That sounds weird considering that's the point of a shampoo, but there are some I tried that don't completely get rid of all the hair product in my hair or I feel like it gets greasy again by the next day... I didn't have those problems with this one. I do wish it gave more lather though. I feel like I have to use wayyyyy more shampoo than I'm used to to get a good lather. Maybe you don't really need to have a huge head of bubbles to get clean hair, but I feel like I do lol! As far as the conditioner, I only use it on the lower half of my hair, leave it in for a few minutes, brush my hair with my fingers and my hair feels nice and smooth even after rinsing.